While being a caregiver to her elderly parents, actress Tina Sloan set out to write a book about the experience. But as she was writing, Sloan happened to look down at her feet. Changing Shoes — the name of her book and her one-woman play — is a metaphor for life changes. 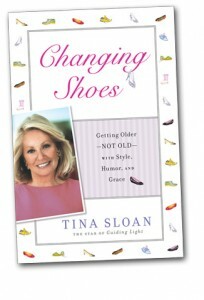 Changing Shoes: Getting Older — NOT OLD — with Style, Humor, and Grace, was published September 2010 by Gotham Books/Penguin Group. Sloan will hold a book party (reading and signing) from 3 to 5 p.m. Thursday at Tory Burch’s Worth Avenue store. Sloan’s play will run March 17-18 at the Lyric Theater in Stuart and on March 20 at the Maltz Jupiter Theater. She lives in New York City and Hobe Sound. The book is about transformation, reinvention and the many evolutions that happen throughout life in order to stay competitive. Sloan, 68, knows a thing or two about staying “in the game” from her 26-year stint as nurse Lillian Raines on the long-running soap opera Guiding Light. But when the lights went out for good on the soap’s 72-year-run in 2009, Sloan was not one to sit idly by. She also had a role in the Oscar-nominated Black Swan, as well as two other 2010 movies Happy New Year and Oh My Love. In her personal life, Sloan has been married to Steve McPherson for 35 years. They have one son, Renny, a Harvard University graduate who served as a captain in the Marine Corps. Sloan has run several marathons and has climbed to the summit of Mt. Kilimanjaro. Changing Shoes is a quick read, mainly because she writes in a conversational, no-holds-barred style. Whether Sloan is describing what it’s like getting older in the soap biz to the depression she experienced as her parents’ caregiver to her only son being deployed to Iraq to running her first marathon in Paris, Sloan makes you care enough to keep reading all the way to the end. The chapter describing her mother’s descent into dementia and her father’s battle with cancer is especially poignant. Sloan opens up and tells it like it is — the good, the bad and the aging. Sloan candidly states that she made the decision years ago that plastic surgery was not for her. Teeth whitening? Yes. But that’s it. Sitting in a makeup chair next to Jodie Foster on the set of the film The Brave One, Sloan describes the conversation. The book opens with Sloan and her soap opera daughter, Beth Chamberlin, walking down 44th Street in Manhattan wearing their designer ballgowns fresh off the Guiding Light set. When they go into a nearby coffee shop, a startling revelation hit Sloan: No one was looking at her. All eyes were on Chamberlin. Sloan felt invisible, which is devastating to a woman, but especially to an actress. It was in those ensuing days, months and years that Sloan decided there was no way to avoid aging, but there is a way to still retain that spark and zest of younger days. “You just have to change your shoes,” she said. Sloan appeared in the Woody Allen films Celebrity and The Curse of the Jade Scorpion. Other feature film credits include Changing Lanes with Ben Affleck, The Guru with Marisa Tomei and People I Know with Al Pacino. Her daytime credits include recurring roles on Search for Tomorrow (“Patti Whiting”), Somerset (“Kate Cannell”) and Another World (“Dr. Olivia Delaney”). Sloan said she began the book so that Baby Boomers would know what preparations they’ll need in place — such as wills, medical care and long-term care — for their older years. But the book grew into so much more.